It’s day 5 of tacos, guacamole, margaritas, mojitos, chalucas (a drink our poolside bartender made up which is basically a mojito with cucumbers and gin instead of rum), and a never-ending quest for churros (we still haven’t found them but we’ve been told where to find the churro lady in downtown so I have high hopes) and here I am having to pretend like it’s winter again and talk to you about butternut squash noodles. Can you imagine being so rich that that becomes a question you ask people and think it’s the norm? Good god, I want her life. Just so you know, she lives in Napa during the summer when not at her home here in Cabo. I didn’t know whether to roll my eyes, bust out laughing or just succumb to the jealousy of that (incredibly nonchalant) statement when she told us. 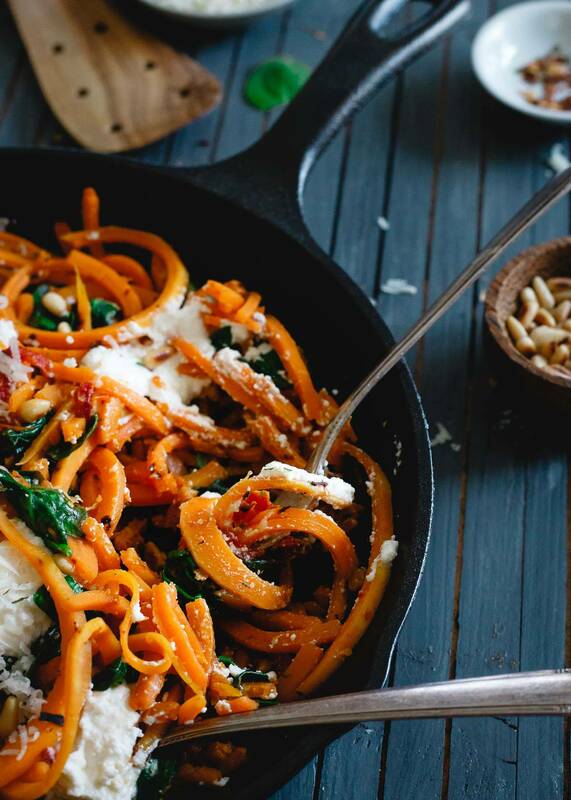 So while I wish I had her life and wasn’t in the freezing cold just 6 days ago, piling wood in the stove to keep my house warm, I was and these garlicky butternut squash noodles were being made for a comforting, healthy dinner. 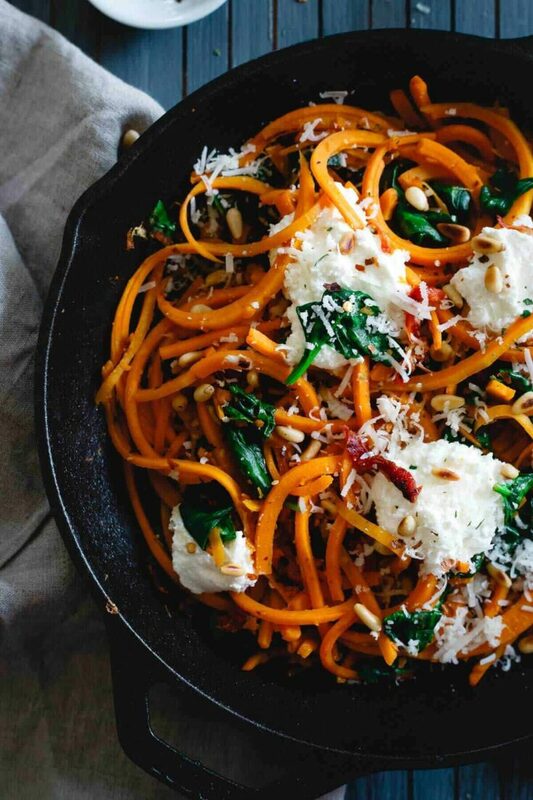 I shared my first spiralizer recipe with you guys just last week with these Chinese chicken noodles and I’m sharing these butternut squash noodles today because this spiralizer is basically my new favorite tool even though I’m approximately 10 years late to the game with it. 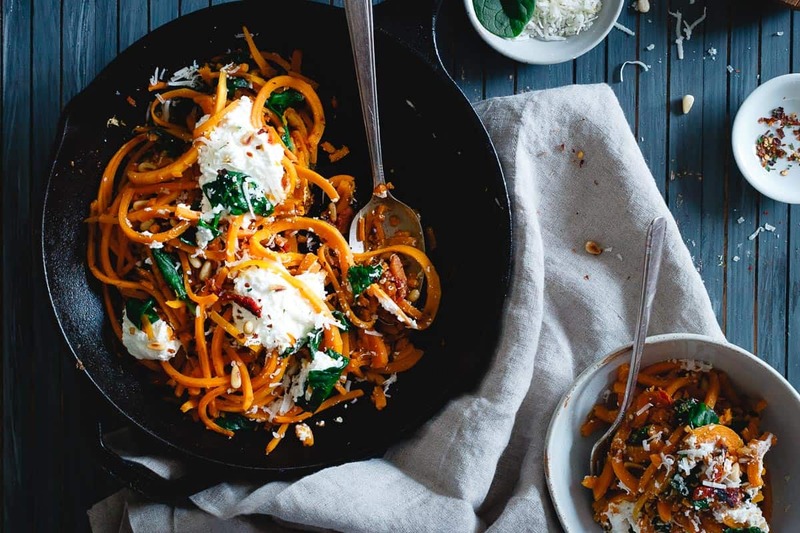 Cooked with lots of delicious garlic until just softened, these butternut squash noodles are tossed with wilted spinach, sun-dried tomatoes, toasted pine nuts and dotted with fresh ricotta. 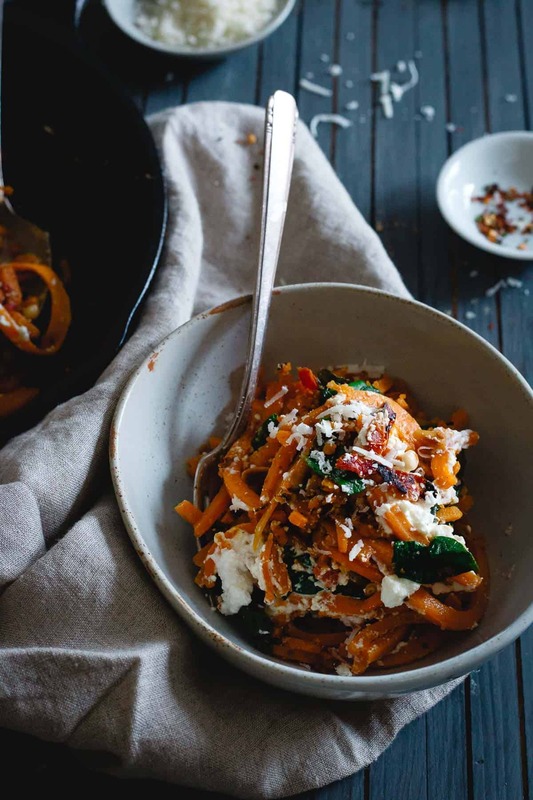 It’s almost like a winter-vegetable version of lasagna (similar to these creamy pesto spaghetti squash noodles) in a deconstructed skillet variety and it’s beyond delicious and comforting. 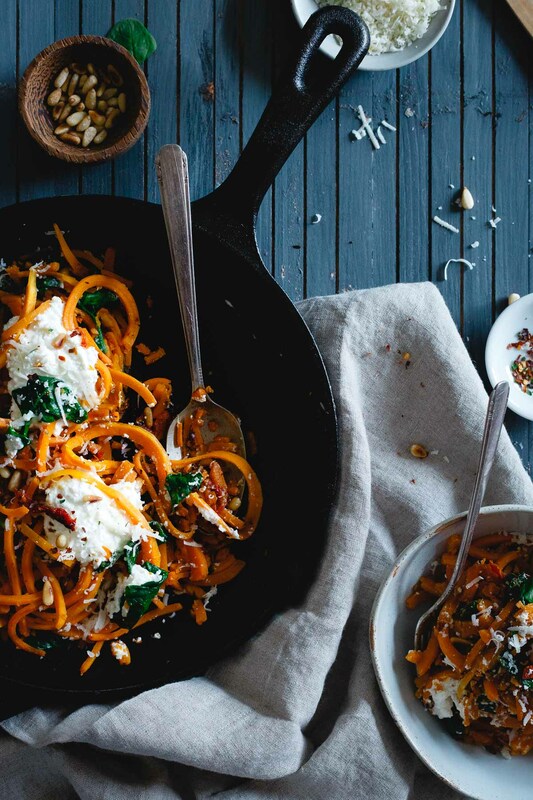 I’d still rather be in Cabo, sipping margs and eating tacos but since we all can’t live that life 24/7 365, I guess I’ll settle for a bowl of these garlicky butternut squash noodles for now. 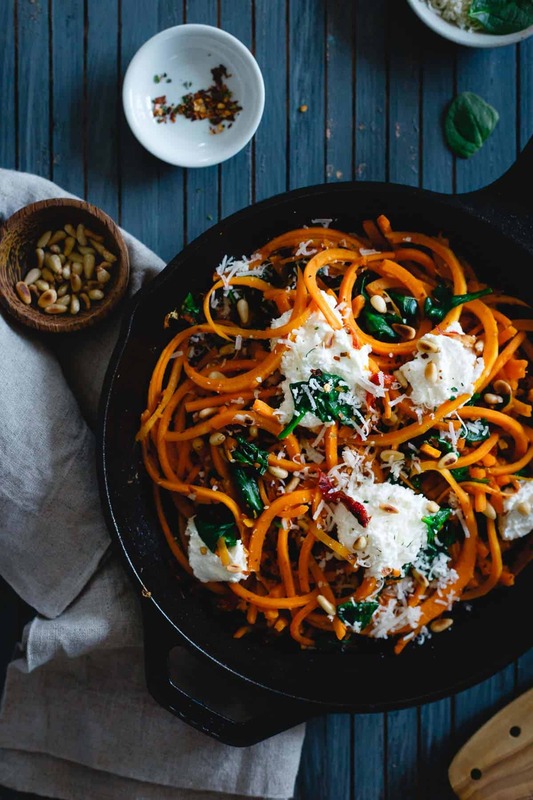 These garlicky butternut squash noodles are tossed with spinach, sun-dried tomatoes, toasted pine nuts and ricotta for a wintry, one-pan vegetarian meal. Heat a large skillet over medium heat. Add pine nuts and toast for 2-3 minutes until lightly browned. Set nuts aside. In same skillet, add the olive oil, garlic and red pepper flakes. Sauté for about 30 seconds until fragrant. Add the butternut squash and gently toss to coat in the garlic and olive oil. Add a splash of water to the skillet and cover with a lid. Cook for 3-5 minutes until noodles are softened a bit. Remove lid, add the sun-dried tomatoes, lemon zest, lemon juice and baby spinach to the skillet. Toss to combine and cook until spinach is wilted, about 2 minutes. Season to taste with salt and pepper. Transfer noodles to a serving bowl. Dollop the ricotta on top. Garnish with the toasted pine nuts and grated parmesan cheese. I’m replying as I eat this. Delishous and simple. How many servings is this meant to offer? It looks great, so I’m trying to add it to my meal planning and shopping list. This was so delicious, I loved it. Tip: double the recipe, you’ll want more. This is absolutely delicious! I forgot the parm but otherwise followed the recipe as written. My husband & I both agreed that it was one of the nicest, most flavorful meal we’ve put on the table in quite some time. I agree with the above poster, while this dish is a generous portion for 2 people you’ll still want more..Yummm! The squash took a lot longer for me to cook than the recipe suggested. Are you preparing your al dente? Yes, mine still has a bite to it but definitely edible. Just cook until your desired doneness :) Did you spiralize the noodles to the same thickness? This was a yummy and easy dish – we were pairing it with glazed salmon and beet noodles, so I just did the oil, garlic, salt, pepper and Parmesan cheese. I look forward to doing the whole recipe some other time.